>His one Super Bowl title, 13 seasons ago. >His 12 Postseason wins (only 3 this decade). 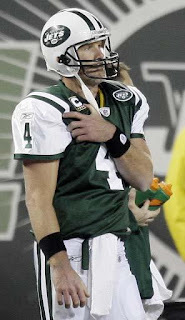 >His 269 straight starts (he'll play even when he's hurt, costing the Jets the playoffs). No QB in NFL history has thrown more interceptions, and no QB in NFL history has intercepted more headline-grabbing opportunities, sending newsrooms around the country scurrying at his whim. Brett Favre will take the field tonight in purple, and we have not changed our stance from earlier this off-season. Below is "A Wing and a Prayer: Buyer Beware" (a Backtime Re-Air). In discussing this move the other day with my wife, (she is very indulgent), she opined that she would not expect her husband (me) to pass up a $25 million payday for something as stupid as what fans think if I could still do the job at least as good as 50% of my colleagues. I'm the first guy to let a guy play if he can still play (and more importantly if someone will take him). But to see Favre's off-season machinations in the last 3 summers, it doesn't sit well. You'd never see Troy Aikman or Steve Young pull this cat-and-mouse game. Viking fans should prepare to have their hearts broken sometime this December.